Linksunten released a statement on their banned website earlier today, saying: “We will be back soon.” It shows that the media activists still have control over their website and could be the beginning of a huge Streisand effect. More solidarity demonstrations today. Refresh the page for updates. Yesterday the German government shutted down Linksunten Indymedia. But at the same day it already became clear that the German government did not fully control the website. Linksunten published a message yesterday morning, saying: “We are offline at the moment…” (screenshot below). The linksunten collective also published an image of Barbara Streisand (image above) with the statement. Below the image the media activists wrote: “Misery for De Mazière!”. Thomas de Mazière is the federal interior minister of Germany. 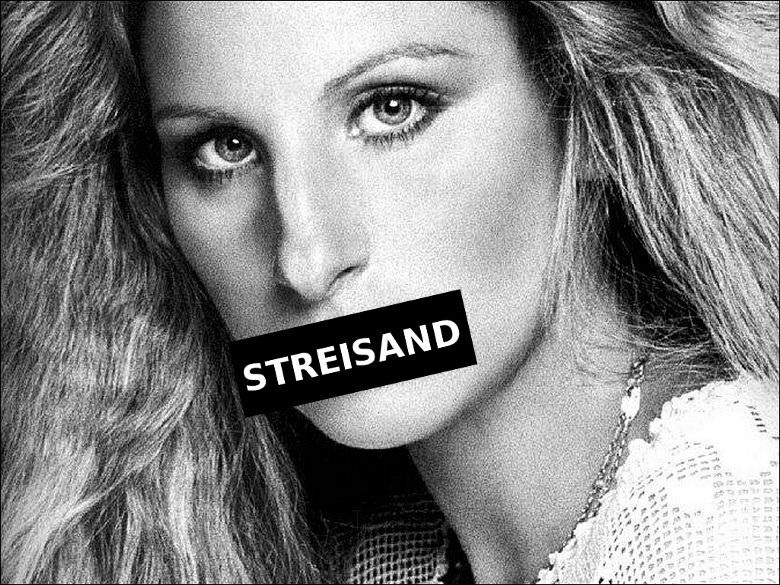 On the image of Streisand, her mouth is masked with tape and it clearly refers to the Streisand effect. The chances that Linksunten will come out stronger after the German government’s censorship on the website are pretty good. Apart from autonomous and other leftwing groups, many opposition parties, civil right acticists and some journalists criticized the repressive action of the interior ministery. Many observers said the ban is a tactical election campaign move. In Germany there will be general elections next month. Ofcourse the fascist AFD party welcomed the ban on Linksunten, many fascists were outed at the website. Linksunten also added parts of the declaration of the Independence of Cyberspace on their website, written by John Perry Barlow in 1996. You can read the full declaration of the Independence of Cyberspace; here. Last night there were solidarity demonstrations with Linksunten in Jena, Bremen and Karlsruhe. Today people are mobilizing for a solidarity demonstration in Freiburg. The demo will start at 07:30pm (19:30) at Augustiner Platz in Freiburg, Germany. Update 03:49pm: People are already gathering with banners in support of Linksunten in Freiburg, Germany. Tonight there will be a solidarity demo with Linksunten in Freiburg. The demo will start at 07:30pm (19:30) at Augustiner Platz in Freiburg, Germany. Images by Twitter account @Demosanis_Sued. Update 03:12pm (CET): Banner in St. Pauli stadium (Hamburg) last night says: “25 years Lichtenhagen. 25 years of German failure. We stay Linksunten!” (image below by @AntifaPinneberg). Update 06:00pm (CET): German magazine Spiegel online reports that Merkel’s governing party CDU and the Bavarian sister party CSU are planning a campaign against “left extremism” before next months general elections. Spiege online also reports that all CDU and CSU state interior ministers are invited to the federal interior ministery on September 1 to present a joint statement in which they will announce that they no longer will tolerate squats like Rigaer (Berlin) and Rote Flora (Hamburg). According to Spiegel online the interior ministers also want to introduce new laws in which its not only a crime to commit acts of violence during protests, but its already a crime to be present at protests where other people commit acts of violence. The presentation of a new wave of repressive measures and laws is part of the CDU/CSU election campaign. By taking over parts of the program of the fascist AFD party, the governing parties want to attract right extrem voters. Update 07:26pm (CET): Another design for avatars, stickers etc (below). Text says: “We are all indymedia – We are all Linksunten”. Update 08:43pm (CET): Ongoing demo in solidarity with Linksunten is not registered, like all autonomous demos in Freiburg Germany. More than 250 people at the demo now. Update 09:13pm (CET): About 300 people at spontaneous demo in solidarity with Linksunten in Freiburg, Germany tonight. #Linksunten: Not in #Germany, Not Anywhere Else : Repression Can’t Silence Us ! | Enough is Enough!